This work by Dan Russell is licensed under a Creative Commons Attribution-NonCommercial-NoDerivatives 4.0 International License. Based on a work at http://www.acs.psu.edu/drussell/bats.html. The content of this page was originally posted on July 17, 2013. Some content was added on September 21, 2017. Why Do Bats Sting for Bad Hits? Disclaimer posted 1/9/17 => this is an INCOMPLETE draft of a page that I am writing. There is quite a bit of content toward that end that needs to be expanded and revised. Anyone who has played baseball or softball for some length of time has probably experienced the painful sting resulting from a poorly hit ball. I have seen college players and adults shaking out their hands after dropping the bat, and I've heard from young kids who want to quit playing baseball because of the pain they experience when the ball is not hit squarely on the sweet spot of the bat. In this web article I'll discuss the vibrations in the bat that are responsible for this painful sting, and what various manufacturers have done in an attempt to minimize the sensation of sting. D. A. Russell, "Bending modes, damping and the perception of sting in baseball bats," Engineering of Sport 6 - Developments for Sports, Vol. 1, pp. 11-16 (2006). Post-impact Vibrations for hits away from the sweet spot. The reason bats sting is because the impact with the ball causes the bat to vibrate, and the vibrations in the handle can result in a painful sensation in the hands of the player holding the bat, especially in the top hand. After talking with quite a few players, it seems that there are two kinds of pain. One is a sort of buzzing sensation at the edge of the palm (opposite the thumb) in the bottom hand, nearest the knob. The other, and more painful sting, is a sharp bruising pain felt in the fleshy webbing between the thumb and forefinger on the top hand (farthest from the knob). The following three high speed video clips (1000 fps) are the property of Easton Diamond Sports, LLC and are shown here with their permission. The three videos show two players swinging the same bat at a ball pitched from a pitching machine. From left to right, the video clips show an impact at the sweet spot, an impact outside the sweet spot (toward the barrel end of the bat), and an impact inside the sweet spot (toward the handle). Impact at the end of the bat (outside the sweetspot) causes the bat to vibrate violently after the collision. The bat barrel initially bends backwards away from the ball while the handle bends outward and the vibration in the handle causes the player's top hand to lose contact with the handle. Impact at the sweet spot does not cause the bat to vibrate. The bat slows down after the collision (bat speed approximately cut in half), but the bat continues to rotate as a rigid object with no vibration. Impact towards the taper region of the bat causes to bat to bend backward in the middle, and sends a vibration pulse down the handle. Notice that the thumb of the player's top hand is violently kicked away from the handle. After impact with a baseball, a baseball bat will vibrate with a number of resonant vibrational bending modes, and the animation at right shows the shapes and typical frequency ranges for the first three bending modes of an 34-inch adult sized baseball bat. Each of these vibrational mode shapes has a number of nodes, or locations where the displacement is zero; and an impact at a node will not excite that particular vibrational shape. The region on the barrel end of the bat, between the nodes for the first two bending modes, is the "sweet zone" of the bat, and impacts within this region (approximately 5-7 inches from the end of the barrel) will result in a minimum amount of vibration in the handle. Ball impacts in this region of the bat barrel also produce the greatest batted-ball speeds. But, more importantly - for the purposes of this article - impacts within the sweet zone do not produce the painful sting in the hands of the player, as shown in the high speed movie at the above left. The range of typical frequencies of vibration for the first two bending vibrational modes fall within the range of greatest sensitivity for the nerves in the human hands. However, there is some disagreement in the literature as to whether the first or second bending mode is more important for the perception of feel and the painful sting for bad hits. Robert Adair (author of The Physics of Baseball) has argued that the hands are most sensitive to frequencies between 100-300 Hz and and relatively insensitive to frequencies above 500 Hz. This would suggest that the first bending mode, with frequencies typically around 170Hz, should be the most important for the perception of feel and sting. Rod Cross (author of The Physics of Baseball & Softball) argues that the time duration of the impulse which travels down the bat handle to the hands is indistinguishable from the period of the second bending mode of vibration, and that both the first and second bending modes must contribute to the sensation of feel and sting. The plot at right was adapted from a landmark study of human response to vibration in hand-held equipment, and shows that the hand sensitivity to vibrations is greatest around 250-300 Hz, while frequencies in the wider range (indicated by the red shaded region) between 125 Hz and 600 Hz are still easily detected and bothersome. This wider frequency range would include both the first and the second bending modes. So, which bending mode is more important: the first or the second bending mode? Or, are they equally important? To answer that question we need to look at the vibrational mode shapes a well, not just the frequencies. As the animation above at right shows, the first bending mode has a node underneath the location of the top hand, while the second bending mode has an antinode (location of maximum displacement) on the handle almost exactly at the spot where painful sting is most strongly felt in the fleshy webbing between thumb and first finger on the top hand. This animation of the mode shapes, combined with the high speed video showing the top hand being violently thrown away from the handle for bad hits, suggests to me that the second bending mode - even with the higher frequency - is the more likely cause of sting. An additional set of evidence that leads me to believe that the second bending mode is most the most important contributor to painful sting, is a test that a bat manufacturer asked me to perform for them, back in 2004. They sent me three identical bats, same make and model, same length and weight, same frequencies. Bat A was brand new, still in the wrapper. Bats B and C had each been modified slightly by injecting some foam into the handle. Bats B and C had both been used to hit balls by 70 youth players, and every single player preferred the same bat. I was asked if I could determine which of the two bats (B or C) the players preferred and why. When the bats arrived in my office, I took each one out of the box, gripped it lightly between two fingers at the barrel and tapped the bat with my knuckle to listen to the vibration. After listening to each bat, I called the manufacturer and told them that I thought bat C was the bat that all of the players preferred and that the reason had to do with the amount of damping for the second bending mode. The bat engineer was quite surprised that I correctly identified the preferred bat so quickly. Then I took the bats to my research lab to carry out a more detailed vibration test to measure the vibration properties of the three bats. As I will discuss later below, the damping property of a structure determines limits the vibration amplitude and determines how quickly the vibration dies away. 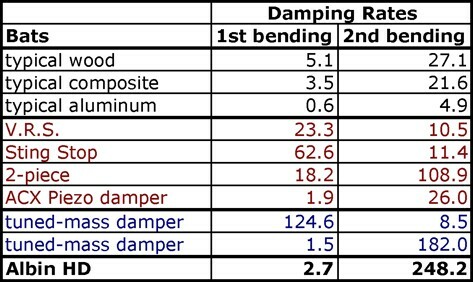 What I found in the lab was that the preferred bat C had about 6 times more damping for the first bending mode, compared to bats B, but the damping for the second bending mode was 30 times greater for bat C than it was for bat B. The graphic at right compares the time signals for the second bending mode, measured on the handle at the location of the top hand and for an impact at the end of the barrel. The black trace is for bat B and the red trace is for bat C, showing that the vibration for bat C never reaches its peak amplitude before beginning to decay, and it has completely decayed in a small fraction of the time while bat B is still vibrating with nearly full amplitude. The difference is that bat C has much greater damping for the second bendingmode, and this is apparently what all 70 of the players who used the two bats preferred. So, based on the experimental evidence I have collected for a large number of baseball and softball bats, my understanding is that the second bending mode is the more important contributor to the sensation of painful sting. The most effective methods for reducing sting target the second bending mode. Several bat manufacturers have tried a variety of vibration absorbers in an attempt to minimize the vibration in the handle that produces the painful sensation of sting for hits away from the sweet spot. Wearing batting gloves and wrapping the handle with leather or rubber grip helps to reduce the vibration slightly, and there are some devices you can attach to the knob that supposedly reduce sting. However, I will limit my survey below to modifications of bats themselves, methods which are designed to much more effectively reduce the vibration at a specific frequency. In 1991, Easton collaborated with engineering firm Rousch-Anatrol to develop a Vibration Reduction System (V.R.S.) for their LX8-V youth bat model. The V.R.S. was also used in the 30-inch youth version of the Black Magic. In 1996, when I was a physics professor at Kettering University, I visited one of the engineering departments at Rousch-Anatrol and was shown one of the Easton V.R.S. bats. Later that year, I managed to find a couple of LX8-V 30-inch youth bats at a used sporting goods store, and cut one of them open to look at and study the vibration absorber. The photographs below show what it looks like. (TOP) Scan of the label from the wrapper of a new Easton LX8-V youth bat, a schematic of the V.R.S. absorber showing its location in the taper region, the frist flexural bending mode of the bat. (ABOVE RIGHT) Photographs of two Easton LX8-V youth baseball bats, with one cut apart to show the V.R.S. absorber in the taper region of the bat. 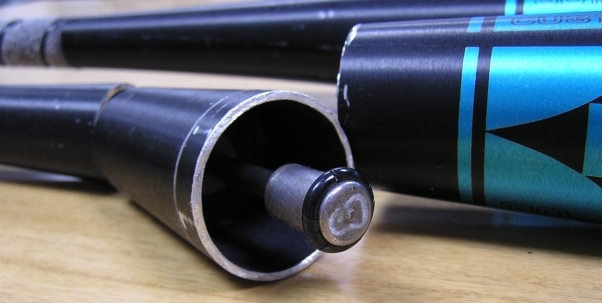 (RIGHT) close-up photo of the vibration absorber. The location of the absorber in the taper region of the bat coincides with the location where the vibration amplitude is maximum for the first bending mode. The V.R.S. absorber is very effective at reducing the vibration of the first bending mode. This can easily be demonstrated by holding the bat lightly in one hand at the handle and tapping the barrel on the ground. A normal aluminum bat will vibrate and produce an easily detected buzzing vibration in the handle, while a bat with the V.R.S. will hardly vibrate at all, and the difference in feel is very noticeable. However, while this device greatly reduces the amplitude of the first bending mode vibration, it does not significantly reduce the second vibrational bending mode which I believe to be more important to the perception of sting. The presence of the absorber mass in the taper region increases both the weight and the moment-of-inertia (MOI) of the bat. Larger MOI bats are more difficult to swing, and since the late 1990's the trend for youth bats has been to go lighter and lighter, to the extent that you can find 30-inch youth bats with weights as low as 16 ounces. In spite of the effective reduction in the vibration of the first bending mode, Easton abandoned the V.R.S. absorber by the late 1990's because it added too much weight to a youth baseball bat. Since the early 1990's, certain Louisville Slugger youth bat models have employed the patented Sims Sting StopTM in the knob. 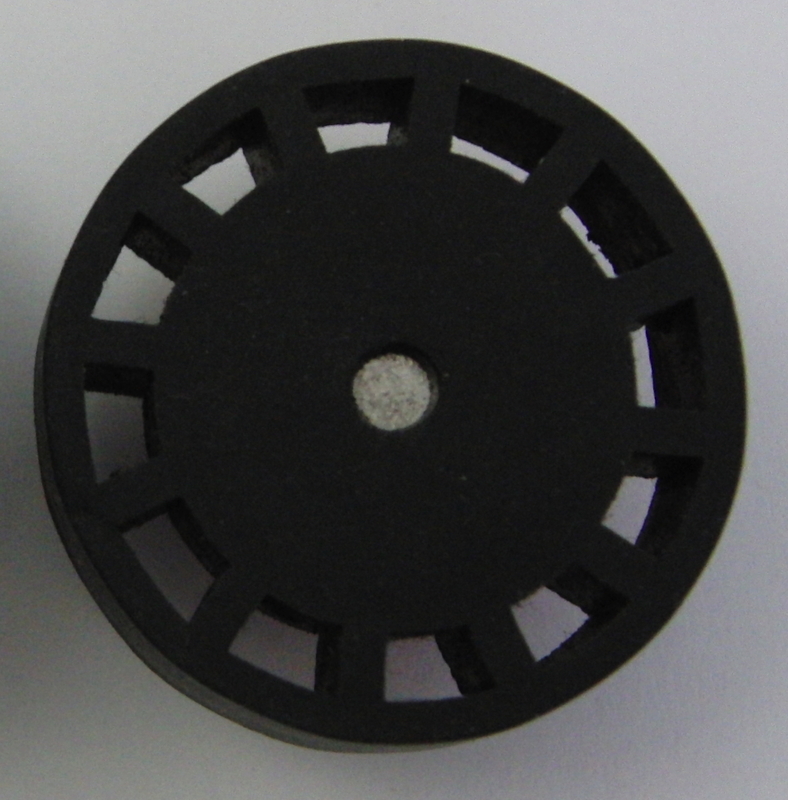 This vibration absorbing device is a rubber piece (see photo at right) that essentially acts as a mass-spring vibration absorber (similar to the Easton V.R.S. system except that the mass and spring are formed from a single piece of rubber instead of being a metal mass attached to a rubber spring). Like the Easton V.R.S., the Sims Sting Stop is tuned to reduce the first bending mode, and it does so rather effectively. This can easily be demonstrated by holding the bat lightly in one hand at the handle and tapping the barrel on the ground. A similar aluminum bat without the Sims Sting Stop will vibrate and produce an easily detected buzzing vibration in the handle, while a bat with the Sims Sting Stop will hardly vibrate at all, and the difference in feel is very noticeable. But, unlike the Easton V.R.S., the Sims Sting Stop in the handle does not appreciably increase the weight or moment-of-inertia of the bat, and so it can be implemented into lightweight youth bats. 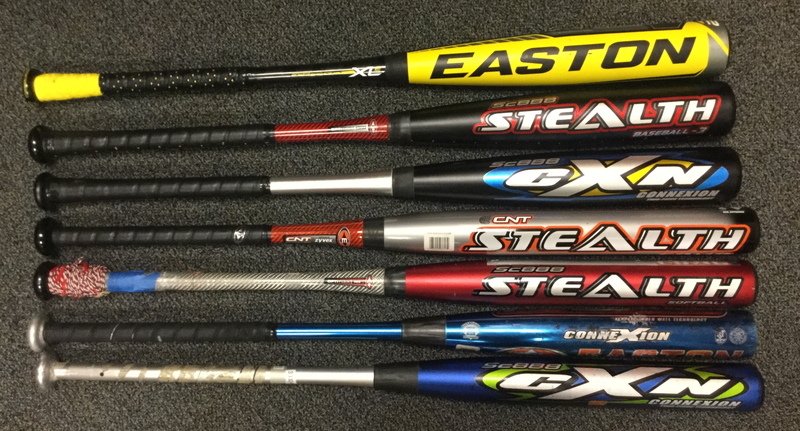 Louisville Slugger youth bats with the Sims Sting Stop are still readily available today. Here is a movie of showing how the Sting Stop effectively reduces the vibration of the first vibrational mode of the bat. In 1998, Worth collaborated with ACX (a company specializing in vibration control using piezoelectric materials) to produce the Copperhead ACX. This bat had a piezo-electric circuit on the handle (underneath the leather grip) in the region of the top hand. A piezo-electric material is a special ceramic that when squeezed, produces a voltage proportional to how much it is squeezed. This circuit-absorber converts vibrational energy in the handle into electrical energy which is then dissipated through resistors; a red LED in the knob lights up with the bat vibrates and the energy is being dissipated. This is kind of a cool marketing ploy - you can tell when the vibration absorber is working because the red LED in the knob lights up. The performance of this piezo-electric vibration absorber was described in the October 1998 issue of Sound and Vibration magazine and I've included a couple of graphics from the article at right. From this article, I found two points of interest that backed up my own research which focused on the second bending mode as the target for vibration reduction to minimize sting. First of all, the location of the ACX piezo-electric circuitry was at the location on the handle where the second bending mode has a maximum negative strain, in agreement with my own findings. Secondly, perhaps as should be expected due to its location, the vibration reduction (indicated in the graph) is more than twice as effective for the second bending mode than for the first bending mode. In December of 2006, I managed to find a used 33-inch, 29oz Worth Copperhead ACX on eBay took it to my lab for testing. My measurements of the damping verify that the piezo-electric circuit damper targeted the second vibrational mode, but it does not provide as much damping as other the other mechanical methods. Following the 1998 college baseball season, the NCAA instituted the minus-3 rule (weight of the bat in ounces must be no more than 3 units less than the bat length in inches) and reduced the allowed barrel diameter to 2-5/8". The ACX Copperhead was a minus-4 with a 2-3/4" diameter barrel so it was not legal for play under the new NCAA rules. I don't know why this damping technique wasn't applied to another model bat which satisfied the new NCAA rules, but it seems that Worth abonded this approach after its initial introduction in 1998. In 1999 Easton introduced a two-piece bat with a separate barrel and handle joined by a patented rubber connection joint that they called the ConneXion (CXN). The photograph at right shows several Easton softball and college baseball bats including some of the first two-piece aluminum softball and baseball bats to use the ConneXion joint, as well as some more recent composite bats with a newer version of the ConneXion joint. The ConneXion joint provides a huge amount of damping, effectively isolating the barrel from the handle and preventing any vibrations in the barrel end from transmitting to the handle and the hands of the player. Placeholder for a video showing how an aluminum bat without the ConneXion continues to ring for several seconds after being hit, while post-impact vibration for a ConneXion bat dies away almost exactly after impact, with no ringing. In March of 2004, a Louisiana inventor by the name of Joel Albin was awarded a patent for a baseball bat knob with a vibration absorber that was designed to reduce the sting from unwanted vibration. Essentially, Albin redesigned a larger knob for the handle of a metal baseball bat to fit the Matthews Harmonic DamperTM a mass-spring vibration absorber designed to reduce vibration in compound hunting bows. [12-13] The text description in Albin's patent shows a complete lack of understanding about how bats vibrate and how vibration in the handle causes the painful senstation of sting. However, the device appeared to work fairly well, though the Matthews Harmonic Damper was tuned for archery bows, and not for baseball bats. From July 2004 through November 2007, I did a fair amount of vibration testing for Albin's marketing group, to help improve the performance of Albin's damper for baseball bats. This was an opportunity for me to test my understanding that the cause of painful sting in the top hand was due to the second vibrational mode of the bat. I measured the vibrational mode shapes and frequencies for a collection of baseball and softball bats to determine the range of frequencies that needed to be targeted, and determined values of the the mass and stiffness of the vibration damper in order to more effectively reduce the unwanted vibration in a bat. My recommendations were implemented in the first generation of bats sold by Albin Athletics. Albin tried to pitch his vibration absorber to several bat manufacturers, but was unable to broker a satisfactory agreement. So he formed his own company, Albin Athletics and starting making and selling his own line of aluminum baseball and softball bats which went commercial in 2007. His bat company was not a commercial success, but it did attract the attention of a successful nearby Louisiana wood bat manufacturer, Marucci Bats, that was looking to expand into the metal bat market. Marucci bought out Albin Athletics and began selling metal bats with Albin's vibration damper. 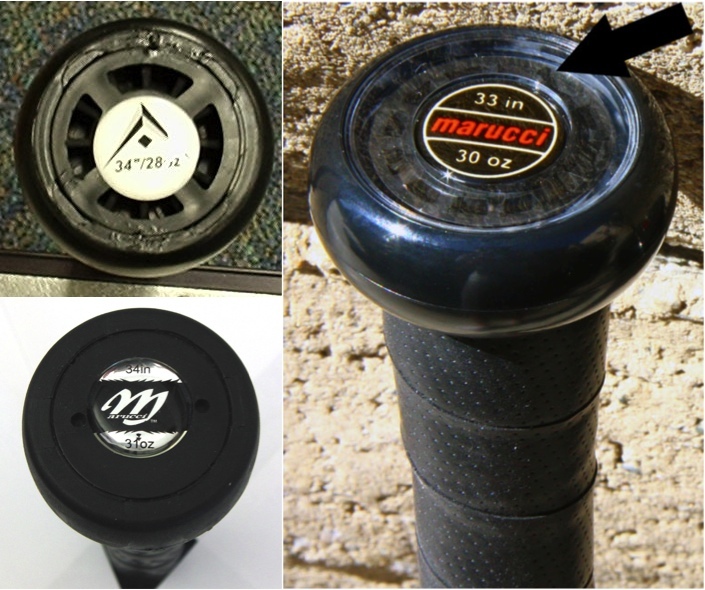 I did additional testing for Marucci in 2010 to help them tune the second generation of the damping device now used in bats like the popular Marucci CAT-5. The current version of the damper (see photo at left) still has a metal mass piece surrounded by a rubber spring, but fits into a much smaller plastic knob. There is an interesting beneficial side effect to the addition of a vibration absorber in the knob. The absorber weighs a couple of ounces to the total weight of the bat. In order to keep the total bat weight similar to other bat models (for example, a minus-3 drop bat would weigh 31-oz for a 34-inch length) weight must be removed from the barrel end of the bat. The reduction of weight in the barrel end and increase in weight in the knob of the handle means that the balance point of the bat shifts toward the handle, and the Moment-of-Inertia of the bat is lowered. This means that Marucci bats with the absorber in the knob, may be swung with more control, and with faster bat-swing speeds. Of course, a bat with lower moment-of-inertia is less effective at transferring momentum and energy to the ball, but this deficiency is easily made up by increasing the elastic properties of the barrel so that the overall performance of the bat is unchanged, while the player can swing the bat with greater control and with greater confidence that they won't get stung. Baseball and softball bats are vibrating structures with many natural modes of vibration, and each vibrational mode has its own resonance frequency. 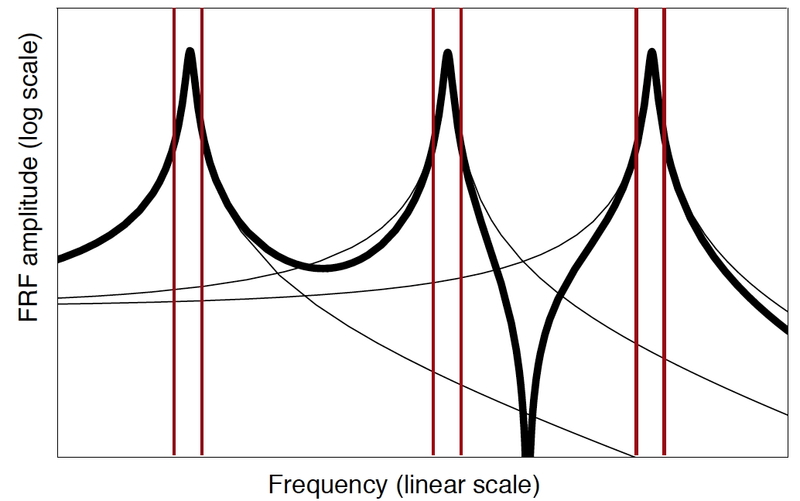 Frequency response function (FRF) has peaks and valleys; the peaks represent the natural resonances corresponding to the mode shapes of the structure, and the width of each peak is directly related to the amount of damping for each particular mode shape. How do the various methods compare? R. Adair, The Physics of Baseball, 3rd Ed., (Perennial, 2002). R. Adair, "Comment on 'The sweet spot of a baseball bat,' by Rod Cross [Am. J. Phys. 66(9), 772-779 (1998)," Am. J. Phys., 69(2), 229-230 (2001). R. Cross, The Physics of Baseball & Softball, (Springer-Verlag, 2011). R. Cross, "Response to 'Comment on "The sweet spot of a baseball bat," [Am. J. Phys. 69(2),229-230 (2001),'" Am. J. Phys., 69(2), 231-232 (2001). D.D. Reynolds, K.G. Standlee, and E.N. Angevine, "Hand-Arm Vibration Part III: Subjective Response Characteristics of Individuals to Hand-Induced Vibration," J. Sound. Vib., 51(2), 267-282 (1977). C. Holden, "Beating those vibration blues," Science Magazine 254, 1290-1291 (November 29, 1991). Richard Smith, “Dynamic Vibration Absorbers,” Sound and Vibration, 32(11):22-27, (1998). 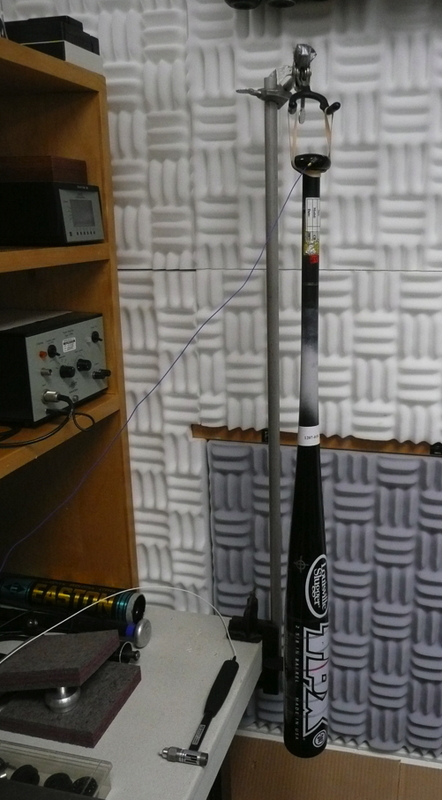 In addition to producing the Sims Sting Stop for Louisville Slugger youth baseball bats, the Sims Vibration Laboratory also produced vibration absorbers for tennis rackets and golf clubs, as well as the LimbSaver for compound hunting bows. http://www.thefreelibrary.com/Sims+vibration+laboratories.-a0168775780. A. Bogue, B.D. Mulcahey, and R.L. Spangler, Jr., "Piezoceramic Applications for Product Vibration Control," Sound and Vibration 32(10), 24-30, (October, 1998). Joel Albin, "Metal base ball bat," U.S. Patent #6709352 B1 (filed Nov. 14, 2001, granted March 23, 2004). www.google.com/patents/US6709352. Matthew McPherson, "Bow handle damper," U.S. Patent #6257220 B1 (filed Nov. 17, 1999, granted July 10, 2001). www.google.com/patents/US6257220. 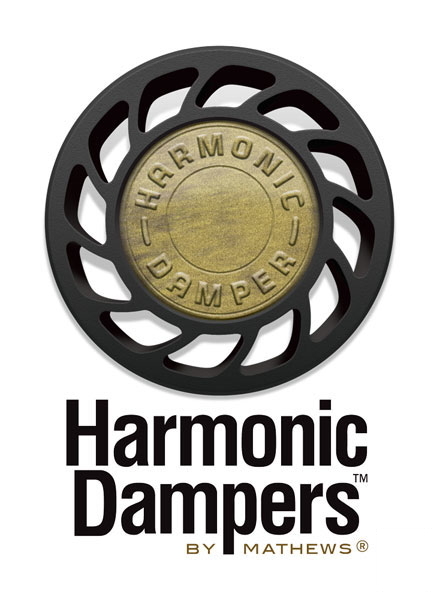 http://mathewsinc.com/why-mathews/history-of-innovation/ (move the slider to the year 2000 to see a short video clip about the Matthews Harmonic Damper).